For the educators who choose to take part in the Two Writing Teachers Slice of Life Story Challenge (SOLSC), March is filled with writing a new blog post each day of the month. Also, “Slicers,” as we call those participating, commit to reading and commenting on at least three blog posts a day. This is truly a challenge. March is more like an Ironman for those educators taking on both challenges! As an educator who has taken part in both the SOLSC and the Classroom SOLSC, I believe both challenges are rewarding and worthwhile. At the same time, I often found myself exhausted during the month and unable to read and respond to all the student posts (i.e., my own students and other students participating in the challenge). The Two Writing Teachers co-authors and I came up with a new plan for this year’s challenge. 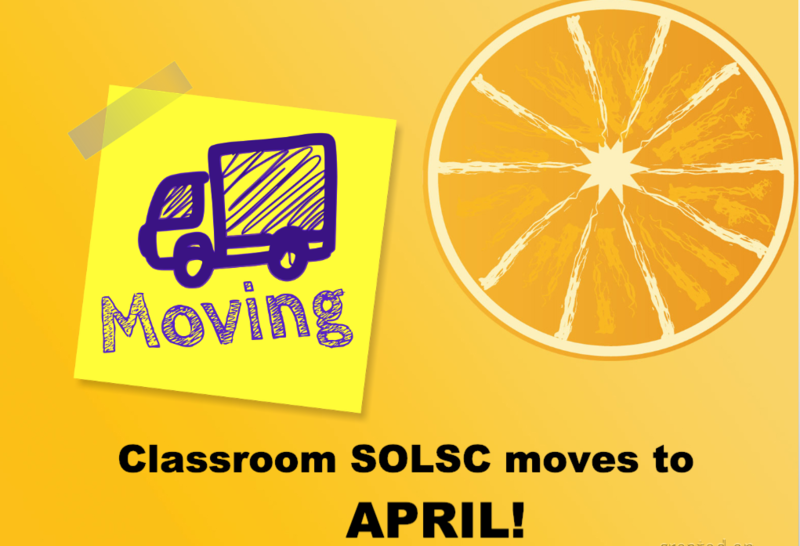 The Classroom SOLSC is moving to April! What exactly is the Classroom Slice of Life Story Challenge? The Classroom Slice of Life Story Challenge is modeled on the Slice of Life Story Challenge. Students take on the challenge to write a slice of life story each day of the month, which will now be April. Some students may choose to do this in a notebook, but students who wish to connect with other classes will write their stories as blog posts. The teacher provides the link to the class blogs on a Padlet. Teachers who are participating can visit the Padlet, click on the link to other classes’ blogs, and read and comment on student writing. In the past, some teachers have teamed up their classes and students have been able to comment on other students writing! Who can participate in the Classroom Slice of Life Story Challenge? Why move the Classroom SOLSC to April? One of the most rewarding parts of the March SOLSC is all the growing you do as a writer. Each year I’ve participated, I’ve reflected on the experience of writing in community each day. We are hopeful that moving the challenge to April will allow educators to take all they’ve learned and experienced in March and use that to create a powerful experience for student bloggers in April. Many areas of the country participate in testing in April and we felt that the blogging challenge would be a positive way to keep enthusiasm for writing alive. We know some schools go on break during April, but other schools break in March, too. Students who are on break from school can continue with the challenge and truly “live like a writer” by blogging each day. Will TWT post each day in April about the Classroom SOLSC? No. Beginning on Sunday, March 31st, there will be a post once a week, on Sundays, which relates to the Classroom SOLSC. The posts are meant to provide inspiration and encouragement for educators who are coaching students in the challenge. The link to the Padlet will be part of the post. The Padlet will be the place to find other classes who are participating in the challenge. Will there be prizes for the Classroom SOLSC? No. 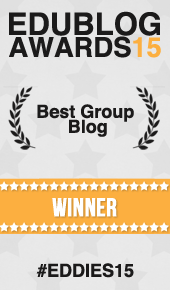 TWT does not award prizes for participants in the Classroom SOLSC. Individual teachers have often chosen different ways to celebrate students who have taken part in the challenge. Some teachers have awarded students badges for accomplishing different writing challenges on the way to blogging for the whole month. If you plan to participate in the SOLSC in March, you may sign up for the Classroom SOLSC by entering your information into the Padlet. The Padlet will be open for educators to add their information, beginning today on January 17th. ( If you do not take part in the March SOLSC, your classroom information will be removed from the Padlet.) You can sign up on the Padlet anytime before April 2, 2019. We hope you and your students will make the move with us in April and be part of the Classroom SOLSC 2019! I’m excited about this change! I did the teacher challenge last year and loved it. I had my students do the student challenge, but I never shared their blogs with an outside community of writers. We just kept it between my two classes. I want to try sharing publicly this year, and I think having it in a separate month will make it more manageable for me. Looking forward to March and April!! Please keep us posted and let us know how it goes for you, Shari. I am surprised by the changes for this year. I enjoyed last year writing alongside my students during the month. It created an awesome classroom community, even with a little competition. There was more buy-in because they saw that I was also completing the challenge right there with them. Also, our school will be doing the state testing for most of the month of April, so we’re going to lose a lot of classroom time due to testing. Most of my students last year used their class time to write, so we are going to lose some time in our Classroom Challenge. I used their writing time last year to encourage the creative entries for the challenge, provide inspiration, and help with editing and revising already completed posts. Now, we need to split that already limited time between reading AND writing, obviously, with less time to dedicate to our posts this year. While I see the benefits to the new way as well, I’m definitely going to miss the way it was last year! Take or delete my thoughts, no worries. Nothing is set in stone. We’re giving this a try this year. As in past years, we’ll ask for feedback once the Classroom Challenge is over. If enough educators would like it moved back to March, then we’ll make that change back. Please keep us posted! Wow, lots of changes! I am definitely in for the SOL Challenge, but trying to figure out how to get the Classroom SOLSC to work this year as we do not have a class blog, never mind individual ones- may have to start a class blog for the purpose and link pictures of their writing… Having it in a separate month from the SOL has plusses and minuses for me, but I look forward to trying it out this new way. Thanks for always being adaptive.